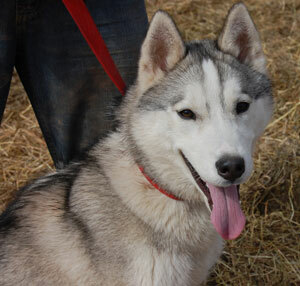 Dempsey is a young grey and white husky that is a knock out! His warm brown eyes and contagious grin are sure to melt your heart. He has quickly become a favorite among the MaPaw family. Dempsey is estimated to be 1 year old and is the typical Siberian that is beautiful, but often misunderstood. This boy is still a puppy and can be quite mouthy when wanting your attention. He has had no apparent training and likes getting his own way. He acts like a big puppy that has not been taught manners. We are working with him on that and he is a quick learner that wants to please. He is good with dogs his size or larger and spends many hours in the fenced-in play area romping with the other huskies. He also enjoys walks and is quite good on a leash ~ for a husky of course! Dempsey will be best placed in a sibe-savvy home that will give him the structure he needs and wants. He needs a home that can lay down the ground work for good behavior. Your reward will be a new best friend that will love you with all he has. If interested in Dempsey, please contact us. We would love to tell you more about this wonderful boy.